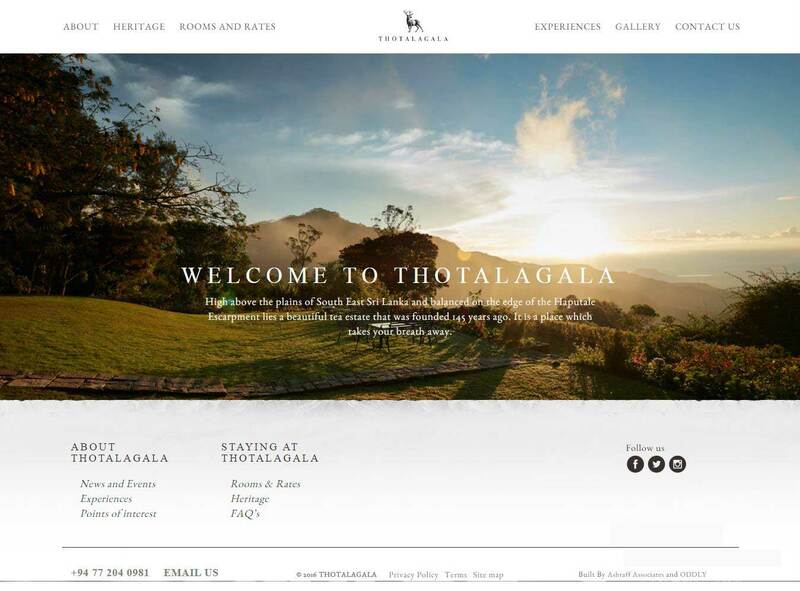 ODDLY launched the website for the latest hotel under Maitland & Knox brand of heritage hotels in Sri Lanka, with our launch of the Thotalagala Plantation House website. This is our second website for the group, after the launch of Galle Fort Hotel completed in 2015. We pride ourselves on being in the business of creating web sites that can balances business goals, brand identity and the user experience and that’s what we sought to do in the case of Thotalagala. Typical projects at ODDLY starts with comprehensive user research as well as industry benchmarking, with design studio sessions with the client trying to understand both user goals and business goals. This allows our team of UX experts can create a product that caters to users, business imperatives, while keeping true to the aesthetics and the values of the company’s brand. We have a process that’s honed with years of experience the leadership team bring to the table, and our focus on UX is unique in the Sri Lankan market. From a button on a page to SEO service we cover all aspects in creating a unique web experience.